Restricted free agent defenseman Paul LaDue has signed a two-year, $1.65-million contract extension, the Kings announced Friday. LaDue, who will be 26 in the upcoming 2018-19 season, has three goals and 12 points in 34 regular season NHL games and 14 goals and 36 points in 74 AHL games. He scored a power play goal in Los Angeles’ 2-1 double-overtime loss to Vegas on April 13, having appeared in two NHL playoff games. LaDue is eligible to become an unrestricted free agent on July 1, 2020. 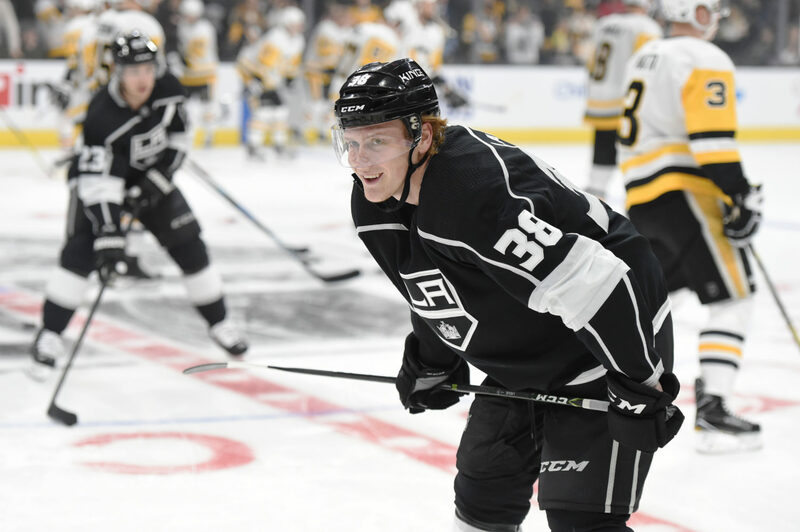 With his signing, Alex Lintuniemi and Kurtis MacDermid are the Kings’ two remaining unsigned RFAs. To quote Darryl Sutter, “the land of opportunity” exists on the horizon for the right-shot defenseman. “I think Paul LaDue deserves a chance to play regular here. He’s earned that last year stepping in and out of the lineup there,” Rob Blake said earlier this month. No longer waiver-exempt and with Drew Doughty serving as the only other right-handed shooter on the blue line, merit will determine what percentage of available minutes will be allotted to LaDue, who has shown some intriguing flashes of offensive ability in his limited NHL tenure to date. Alec Martinez, Dion Phaneuf and to a lesser extent Oscar Fantenberg are left-handed shooters with NHL experience on the right side, so the Kings remain ably cushioned if inconsistency is experienced en route. Though there was some kid gloves treatment – he was more inclined to begin a shift in the offensive end than any other L.A. defenseman who appeared in multiple games – LaDue finished with some impressive shot and chance-based counts. In nearly 155 minutes of five-on-five time, he finished +45 in shot attempts for-against, +6 in goals for-against, +24 in chances for-against and +7 in high danger chances for-against, per Natural Stat Trick. He has also proven to show some punch as a power play role player, having recorded two of his four career goals and six of his 13 career points over his 36 regular and post-season games while on the man advantage. …and add Matt Greene’s $833,333 buyout cost and the $1.57M for Mike Richards’ termination and recapture, you come up with a 23-man roster at an approximate cost of $78.24M with $1.26M of cap space. Again, the above is a general template. It assumes the team opens the year with 14 forwards and seven defensemen, but that could change if, in one scenario, both Oscar Fantenberg and Daniel Brickley earn roster spots out of training camp and the Kings decide to go with one extra forward instead of two. There are still spots to be won and cemented by players on the peripherals of both the forward and defense groups. LaDue, who celebrates his 26th birthday on September 6, is a 6-foot-2, 198-pound native of Grand Forks, N.D. He was selected in the sixth round of the 2012 NHL Draft and won the 2016 NCAA championship with the University of North Dakota.